Flavor perception depends not only on the multisensory integration of the sensory inputs associated with the food or drink itself, but also on the multisensory attributes (or atmosphere) of the environment in which the food/drink is tasted. We report two experiments designed to investigate whether multisensory atmospheric cues could be used to influence the perception of a glass of whisky (that is, a complex but familiar product). The pre-test (experiment 1) was conducted in the laboratory and involved a sample of 18 participants (12 females, 5 males, and 1 who did not specify gender), while the main study (experiment 2) was conducted at a large purpose-designed whisky-tasting event held in London, and enrolled a sample of 441 participants (165 female, 250 male, and 26 who failed to specify their gender). In the main experiment, participants were exposed to three different multisensory atmospheres/rooms, and rated various attributes of the whisky (specifically the nose, the taste/flavor, and the aftertaste) in each room. Analysis of the data showed that each multisensory atmosphere/room exerted a significant effect on participants’ ratings of the attributes that the atmosphere/room had been designed to emphasize (namely grassiness, sweetness, and woodiness). Specifically, the whisky was rated as being significantly grassier in the Nose (‘grassy’) room, as being significantly sweeter in the Taste (‘sweet’) room, and as having a significantly woodier aftertaste in the Finish (‘woody’) room. Overall, the participants preferred the whisky when they tasted it in the Finish room. Taken together, these results further our understanding of the significant influence that a multisensory atmosphere can have on people’s experience and/or enjoyment of a drink (in this case, a glass of whisky). The implications of these results for the future design of multisensory experiences are discussed. Over the past few years, researchers have increasingly started to investigate the effect of ambient cues on people’s perception of the sensory qualities of, and their hedonic responses to, a variety of food and drink items [1, 2]. Of particular interest in the context of the present research are those studies that have investigated the effect of the multisensory ambience (or atmosphere) on people’s perception of alcoholic beverages [3–6]. The renewed interest in the role of context on people’s eating and drinking experiences can be linked to Pine and Gilmore’s [7, 8] influential ideas around experiential marketing (this idea itself inspired by the earlier work of Kotler ). However, the majority of studies that have been conducted to date, have tended to investigate the effect that modifying just a single aspect (or unisensory input) of an environment has on the overall experience. Nevertheless, a few studies have recently started to investigate the consequences of manipulating the multisensory environment (for example, by varying not only what people hear but also what they see [2, 6]). The hope here, based on the available neuroscientific evidence [10, 11] is that manipulating the multisensory atmospherics, at least when the senses are stimulated in a congruent manner, is likely to have a more dramatic effect on the experience of consumers than manipulating any one sense in isolation. What is more, it may do so in ways that can enhance the quality of life of consumers . As Stein and Meredith  put it in their book The Merging of the Senses: ‘Integrated sensory inputs produce far richer experiences than would be predicted from their simple coexistence or the linear sum of their individual products…The integration of inputs from different sensory modalities not only transforms some of their individual characteristics, but does so in ways that can enhance the quality of life’. The growing research on atmospherics has already provided convincing evidence that the unisensory aspects of the ambient environment can exert a profound influence on people’s perception and behavior. For example, Oberfeld et al. conducted a study showing that simply by changing the color of the ambient lighting (from white to blue, red, or green) it is possible to change people’s perception of a glass of wine. In particular, people rated a wine sampled from a black tasting glass as tasting up to 50% sweeter when sampled under red ambient lighting than when sampled under one of the other lighting colors. Note that although the initial study here was conducted with visitors to a winery on the Rhine, the experiment was subsequently replicated in two further experiments under more controlled laboratory conditions. Importantly, broadly consistent results were obtained in the two very different environments: one real world and ecologically valid (but harder to control experimentally), the other strictly controlled but lacking in ecological validity. Meanwhile, Gal et al. reported that the overall brightness of the background lighting in a room can influence people’s consumption of coffee. In particular, individuals who like their coffee strong tend to drink more coffee under bright lighting, whereas those who like their coffee weaker tend to drink more under dim illumination conditions. In this case, the study was conducted only under laboratory conditions (Table 1). aSome studies had more than one group of participants. Although the results of those studies that have investigated the effects of changing the visual attributes of the environment are certainly impressive, far more research has been conducted (or at least published) into the effects of changing the background music [1, 14–17]. For example, North  conducted a study designed to assess the influence of background music on people’s rating of a glass of wine. Participants in this study were exposed to different pieces of music that were pre-selected based on the emotions they evoked, including ‘powerful and heavy’ , ‘subtle and refined’ , ‘zingy and refreshing’ , and ‘mellow and soft’. The students rated the wines as being significantly higher in particular emotions when the emotion-related music was played in the background. So, for example, the wine was rated as significantly more powerful and heavy when music that had been rated as powerful and heavy was presented in the background (for example, Carl Orff’s music, see Spence’s review of the literature on music and wine ). Similarly, the wines were rated as significantly more ‘zingy and refreshing’ when the track from the band Nouvelle Vague was played. Interestingly, however, North did not find that background music had a significant effect on how much the participants liked the wine. It would therefore seem that the music influenced the descriptive, rather than the evaluative aspects of the tasting experience . In another recent study, Stafford et al. had 80 participants take a sip from each of five alcoholic drinks (varying in alcohol strength). These researchers reported that auditory stimulation (that is, music that had been pre-selected to be distracting), affected participants’ ability to discriminate the relative alcohol content of the various drinks. Stafford et al. also reported that background music resulted in participants rating the drinks as tasting sweeter compared with a no-music control condition (but see Woods et al. for contradictory evidence suggesting that loud background noise actually suppresses ratings of both sweetness and saltiness). Crisinel et al. have also shown that the taste of a food (in this case a bitter-sweet toffee) can be systematically modulated by altering the sonic attributes of soundscapes that happen to be played together with the food . Taken together, the results of these various studies support the idea that the way in which people experience food and drink is multisensory, and that the information presented to one sensory modality can influence the way in which people perceive information in other modalities. These results also suggest that such multisensory interactions can influence people’s choice behaviors as well. Crucially, the multisensory attributes of the environment, or atmosphere, in which people order and consume drinks, appears to be far more important than many of us would have guessed. Here, it is important to note that it is not just visual and auditory atmospheric cues that influence people’s perception of drinks and their consumption experiences (as shown above). Schifferstein et al. 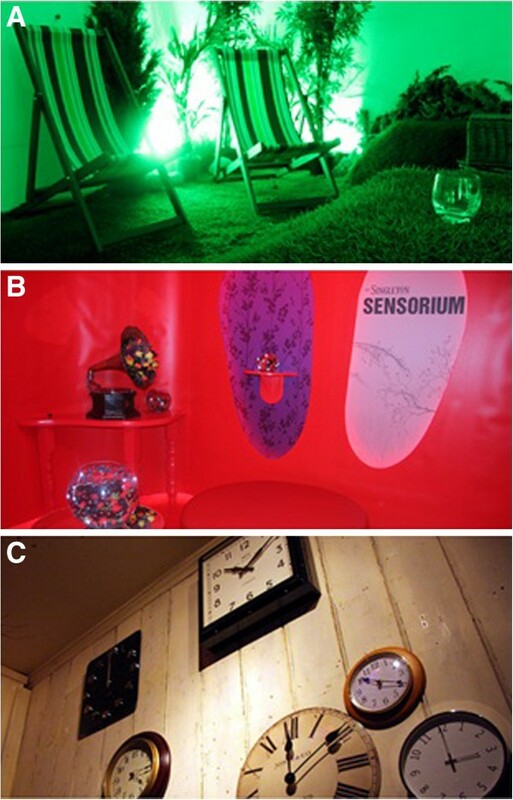 reported that the release of ambient scent (orange, seawater, or peppermint) to cover up the unpleasant scent in a dance club provided an effective means of improving people’s evaluation of the evening (see also the review by Spence  for earlier studies of the influence of fragrance release in a variety of commercial spaces). It is worth noting that the majority of interventions that have been investigated to date have been of a purely unisensory nature; that is, researchers have varied only the lighting, music, or scent (see Table 1 for a representative summary of studies that have been conducted on atmospherics and their effect on food/drink perception). Although such results are undoubtedly very important, it is possible to go even further and to think about how multisensory changes to the environment might influence people’s perception and behavior. The most profound effects of manipulating the atmosphere on the perception of food and drink are likely to occur when those changes are multisensory [2, 6, 11]. For instance, Wansink and Van Ittersum  conducted one of the few studies to have manipulated multiple sensory aspects of the environment at a given time, evaluating the influence of both the lighting and music, in a North American fast food restaurant. They showed that modifying the auditory and visual attributes of the environment, specifically, softening the music and lighting to create ‘a more relaxed atmosphere’ , resulted in diners rating the food as being significantly more enjoyable, while at the same time consuming 18% fewer calories. Although, this may be thought as counterintuitive in that people enjoyed the food more but ate less, the authors suggested that soft music and lights may actually slow consumption, thus making people eat less rapidly and hence enjoy their food more. Indeed, this is consistent with the idea that eating more slowly is related to higher satisfaction levels and lower energy intake . Finally, Sester et al. recently conducted a study in which they assessed the effects of varying the audiovisual context on people’s selection of an alcoholic drink (beer) in a bar. These researchers created two different environments varying in ‘warmth’ – one populated with ‘cold’ furniture, the other with furniture designed to convey an impression of ‘warmth’. They also presented a variety of video clips and music, again chosen to convey the notion of warm versus cold environments. The results showed that drink choice can change as a function of the environment in which people make their beverage-related decisions. To our knowledge, research concerning the influence of multisensory environments on alcoholic beverages has mainly been focused on the perception of wine [3, 4], and research is still needed to assess the perception of drinks such as whisky. In addition, the alcohol industry, and this includes the world of whisky, has recently become much more interested in understanding and designing multisensory drinking experiences that are more enjoyable for their customers. Consequently, and based on the idea that the multisensory environment is likely to influence our perception of food and drink at least as much as when only a single element of the environment has been manipulated, we conducted two studies to assess any influence of a variety of multisensory atmospheres (congruent with particular attributes thought to be present in the whisky) in emphasizing the perception of three different attributes of the whisky: its grassiness, sweetness, and woodiness. It is important to note that although there may not be perfect agreement about the flavor attributes that should be used to describe whiskies, the ones selected here have been (and are) commonly used in the whisky industry [25, 26]. The first study, which was effectively a pilot for the main experiment, included the presentation of three different audiovisual displays designed to emphasize these features in the drink (whisky) that participants had been given to evaluate. Subsequently, a second study was conducted under much more realistic, and ecologically valid, testing conditions. Three different atmospheres were created in three different rooms that had been designed specifically to emphasize particular attributes of the whisky. The experiment was reviewed and approved by the Central University Research Ethics Committee of the University of Oxford (reference number: MSD-IDREC-C1-2013-074), and complied with the Helsinki Declaration. In the first study, 18 non-smoking participants (12 females, 5 males, and 1 who failed to specify gender; age (mean ± SD) 34.7 ± 14.5 years, range 23 to 65 years) verbally agreed to participate in the study after the experimental procedure had been explained and their questions were answered. In total, the participants took four sips of a 12 year old single malt Scotch whisky with 40% alcohol volume from Dufftown, Scotland (The Singleton; Diageo plc, London, UK). The whisky was stored at approximately 19°C. Each sip of the whisky (approximately 20 ml) was taken in a different experimental condition, and was tasted neat (that is, without being diluted as would be typical in the UK) in a polystyrene foam (Styrofoam) cup of 177 ml capacity. All participants swallowed each sip, and after answering the questionnaire, used water as a palette cleanser before continuing with the next experimental condition. In three of the conditions, the participants were presented with a short audiovisual display, with one video designed to be ‘grassy’ , the second to be ‘woody’ , and the third to be “sweet” (Figure 1). In the fourth (control) condition, the participants sampled the whisky in the absence of any video. Still frames taken from each of the three audiovisual displays designed to emphasize the attributes of the whisky in the laboratory-based pre-test (experiment 1). (A) Grassy, (B) sweet, and (C) woody attributes. Participants were given a different sample of whisky to taste in each condition. This aspect of the experimental design meant that the participants were unaware of whether the whisky that they were tasting was the same from one experimental condition to the next. The ‘grassy’ audiovisual display included a close-up video of grass blowing in the wind and a background soundtrack, which consisted of a summer meadow soundscape with birds singing and the sound of the wind rustling through trees. The ‘sweet’ audiovisual display consisted of a dynamic image that alternated between red and black, based on previous research showing that red can influence our perception of sweetness . This image was presented together with a soundscape created using the Yamaha Grand piano plug-in. This was passed through the Space Designer reverberation (reverb) unit set to 100% wet (amount of reverb) and 10% dry (amount of the original signal). The notes were based on the F scale pitched around C4 to C6 (midi notes 60 to 84) and superimposed with a sine wave-based synthesized tone generated in the Sculpture Modeling synthesizer plug-in in the same pitch (all the items used were obtained through Logic Pro X software, Apple, UK). This auditory piece was designed and has been used based on suggestive evidence about the association between high-pitched piano notes and sweet tastes [21, 28]. Finally, the ‘woody’ audiovisual display consisted of a video showing a close-up image of the grainy texture of a piece of wood, while the camera moved slowly across its surface. The soundtrack consisted of the sounds of leaves and twigs being crunched underfoot. All soundtracks were played at a comfortable listening level. The visual material was obtained by recording both grass and wood, and all the videos had a length of 13 seconds. A within-participants experimental design was used. Participants were told that they would sequentially be given four small samples of whisky to taste. They were also informed that, for certain of the samples, they would view an audiovisual clip while tasting the whisky, whereas for one of the samples there would be no video. Participants had to rate various sensory (grassy, sweet, woody) and hedonic attributes (liking of both the Whisky and the audiovisual) of the whisky using 10-point scales ranging from 1 (‘not at all’) to 10 (‘very’). Participants made the ratings using a paper-and-pencil score sheet. The experiment was conducted in three groups of six participants, and the order was changed across groups. Participants were instructed not to smell (nose) or taste the whisky until they had been instructed to do so by the experimenter. Approximately 5 seconds after the audiovisual display started, the participants were instructed to first nose and then to taste the whisky. After each condition, the participants returned the sample to the experimenter and continued onto the next condition. Altogether, the experiment took about 15 to 20 minutes to complete. The results of this preliminary experiment are highlighted in Figure 2. The data were analyzed using a one-way repeated measures analysis of variance (ANOVA). In certain of the ANOVAs, the Greenhouse-Geisser correction was used to correct for sphericity (this applied to both Experiment 1 and 2). There was a significant difference in the ratings of the grassy attribute between the audiovisual conditions (F(2.095, 35.610) = 3.966, P = 0.026). Further pairwise comparisons were conducted using the least squares difference (LSD) correction. When the participants were presented with the grassy audiovisual display, they rated the whisky as being more grassy compared with the other conditions (P < 0.05 for all comparisons). The whisky was rated as grassier in the grassy condition (mean ± SD 5.38 ± 1.85) than in the control (4.33 ± 2.00), woody (4.05 ± 1.66), or sweet (4.05 ± 1.89,) conditions. Summary of mean ratings in each condition for Experiment 1. Participants rated the whisky as (A) grassy, (B) sweet, (C) or woody, using a 10-point scale from 0 (not at all) to 10 (very). The error bars show the standard errors of the means. Although the analysis did not reveal any significant difference between the audiovisual conditions in terms of the sweetness ratings, watching the putatively ‘sweet’ audiovisual resulted, on average, in the participants giving the highest numerical ratings on this attribute. The whisky was rated as sweeter in the sweet condition (4.72 ± 2.37) than in the control (4.20 ± 2.19), woody (3.83 ± 2.52), or grassy (4.33 ± 2.76) condition. A significant difference between the woody ratings across the audiovisual conditions was documented (F(3, 51) = 8.068, P < 0.001). Pairwise comparisons showed that the participants rated the whisky as tasting significantly more woody when the woody audiovisual was presented compared with any of the other conditions (P < 0.005 for all comparisons). Specifically, the whisky was rated as woodier in the woody condition (6.66 ± 1.87) than in the control (5.16 ± 2.33), grassy (4.77 ± 1.73), or sweet (5.05 ± 2.53) conditions. In summary, having participants view the various audiovisual displays did have an effect on their ratings of the whisky, with the exception of the sweet audiovisual display, although a non-significant trend in the expected direction was seen (this trend may well have reached statistical significance had a larger number of participants been tested). In particular, the grassy and woody notes were significantly more prominent after participants had viewed the appropriate audiovisual display. Taken together, the results of our first experiment suggested that viewing a short audiovisual display can exert a significant effect on people’s rating of the taste/flavor of a whisky. By contrast, no significant differences between conditions were obtained in terms of participants’ liking of the whisky (Figure 3). Moreover, although analysis of the data failed to reveal any significant effect of the audiovisual displays, there was a borderline significant trend in the data toward participants liking the grassy more than the woody audiovisual display (P = 0.052). Summary of participants’ mean ‘liking’ ratings in Experiment 1. After watching each of the audiovisual displays, participants used a 10-point scale (0 (not at all) to 10 (very)) to rate their liking for (A) the whisky and (B) each of the audiovisual displays. The error bars show the standard errors of the means. Based on these promising initial findings, we decided to extend the results of this experiment to a much larger sample size (from 18 to more than 440 participants) and to test the participants under more ecologically valid multisensory conditions in our second experiment. The final layout of experiment 2 was based on the input of experiment 1, but included a design/creative element that was added to the new new multisensory environments. In total, 441 participants (165 female, 250 male, and 26 who failed to specify) took part in the study. The experiment was conducted at The Singleton Sensorium multisensory whisky tasting event held in Soho, London. All of the participants were volunteers recruited primarily by online advertisement and through media coverage of the event that appeared in the press in the weeks preceding the event. The advertisements included information about the general aim of the event (for example, assessing the influence of environmental cues on the taste of whisky), and the general procedure; namely, that the event would have three rooms, and that participants would go to each room while drinking the whisky. Because the experiment was conducted through a public event, the participants did not sign a consent form; however, the purpose of the study and the experimental procedure was explained, and only the participants who agreed to participate were offered a place in the event. Each participant was given a flat-bottomed glass containing approximately 60 ml of the same whisky used in experiment 1. The participants were also given a scorecard and pencil with which to enter their responses in each of the three rooms. The participants were then led, in groups of 10 to 15, through the three different rooms. The majority of the participants started in the Nose room, went from there to the Taste room, and ended up in the Finish room. Each room was designed so as to emphasize a particular attribute of the whisky. A different fragrance and soundscape was presented in each room. The visual design used was also very different in each of the rooms (Figure 4). The fragrances were created specifically for the event by Condiment Junkie. Photographs illustrating details of the visual design used in the three rooms. These rooms were designed to emphasize specific attributes of the whisky: (A) grassy, (B) sweet, and (C) woody attributes of the whisky. Images are courtesy of the British Broadcasting Corporation on March 26, 2013 (http://www.bbc.co.uk/food/0/21864151). The Nose room This room had grassy turf laid on the floor, green-leafed plants placed around the walls, and green lights pointed at the white walls of the room. A croquet set had been placed on the ground, and there were three deck chairs in which participants were encouraged to sit. A blend of galbanum and violet leaf was used to create a fragrance that was reminiscent of fresh cut grass in the Nose room. The soundscape was recorded in a summer meadow, with birds singing and wind gently rustling the leaves of the trees. Occasionally, a sheep could be heard ‘baa-ing’ in the background. The Taste room This room was illuminated by round red globes hanging from the ceiling in the centre of the room. The few scattered padded chairs in the room were also round, as was all the furniture and window frames. A round bowl of ripe red fruits was also placed conspicuously on the round table in the centre of the room. In fact, there was nothing angular in this room. This aspect of the experimental design was based on previous research showing that people generally associate sweetness with roundness rather than angularity [29, 30]. A blend of prunol and aldehydes was used in the Taste room. This fragrance was designed to be evocative of sweetness but not to be associated with a specific foodstuff (such as might have been the case had we used the smell of caramel, strawberry, or vanilla). Informal questioning of a number of participants revealed that the majority thought that ‘sweetness’ was the most appropriate of the four basic taste descriptors for the fragrance that was presented in this room. The soundscape included the high-pitched consonant sound of tinkling bells. Importantly, these sounds were presented from a loudspeaker situated in the roof to ensure the congruency between the pitch of the sound and its elevation in space (see Spence’s review  of the literature on crossmodal correspondences between, for example, pitch and elevation). The Finish room The floor and walls of the Finish room were made of exposed wood panels. The room was dimly illuminated, and wooden boxes were stacked up on the floor on one side of the room. There were also several wooden chairs and a wooden bench. A leafless tree was placed in a corner. A large number of clocks were mounted on one of the walls. The fragrance used in the Finish room consisted of a blend of cedarwood and tonka bean, both associated with woodiness in the mind of the perfumier. The soundscape that was presented in this room included the sound of creaking timbers, a crackling fireplace, the occasional sound of someone walking through the dry leaves on the forest floor, and occasional low notes being played on a double bass (a wood instrument). A within-participants experimental design was used. Once the participants arrived at the Sensorium event, they were directed to the bar situated on the first floor. There, they were instructed to wait until they had received a unit of the whisky in a glass. While the participants were waiting, the staff members organizing the event approached the participants and made sure that everyone had a questionnaire and a pencil. They also provided some general introduction to the background and purpose of the event/study. After the instructions had been given, a bartender provided each participant with a glass of whisky. With their glass in hand, the participants then proceeded to the first room, together with a guide, who provided them with a description of each of the rooms, and gave instructions about the completion of the questionnaire. The participants were taken in groups of 10 to 15 through the three rooms, spending around 5 minutes in each room. The participants were first given a few moments to acclimatize themselves to the room, before rating how much they liked its atmosphere. The participants were then instructed to nose the whisky and to have a small sip before filling in the rest of the questions in the appropriate column of the questionnaire: the left column in the first room, the middle column in the second room, and the right-hand column in the third room. Finally, the participants were encouraged to move to the next room after having completed the relevant section of the questionnaire and asking any pertinent questions to their guide. Given that the participants spent around 5 minutes in each room, the entire experiment took approximately 20 minutes to be completed. The scorecards and pencils were collected by one of the organizers from the participants as they left the third and final room, before they were escorted from the building. 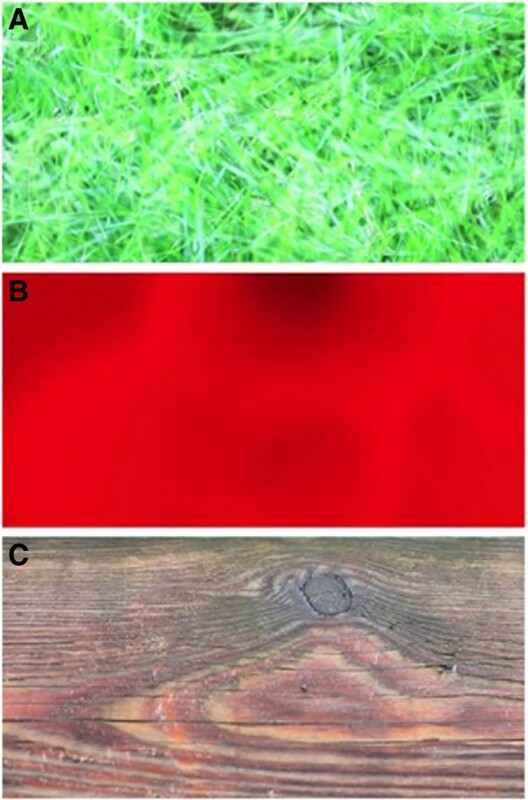 An ANOVA was conducted to assess any differences in participants’ ratings of the grassy attribute between conditions (that is, between the multisensory environments). A significant result was obtained (F(1.906, 819.627) = 182.154, P < 0.001), and pairwise comparisons (using the LSD correction) showed that when the participants responded in the Nose room, they rated the whisky as significantly more grassy (5.4 ± 2.30) than when they responded in the Taste (3.33 ± 2.08) or Finish rooms (3.59 ± 2.24) (P < 0.001 for both comparisons, see Figure 5). Furthermore, the participants rated the whisky as significantly more grassy in the Finish room than in The Taste room (P = 0.017). Mean ratings for each of the three rooms in Experiment 2. Participants rated the whisky as (A) grassy, (B), sweet, or (C) woody on a 10-point scale ranging from 0 (not at all) to 10 (very). The error bars show the standard errors of the means. Moreover, a significant difference between conditions (rooms) was also found with regard to participants’ ratings of the sweetness of the whisky (F(2, 864) = 68.817, P < 0.001). Pairwise comparisons showed that when the participants responded in the Taste room, they rated the whisky as being significantly sweeter (6.08 ± 2.02) than when they responded in either the Nose (5.07 ± 2.08) or the Finish room (4.72 ± 2.13) (P < 0.001 for both comparisons). In addition, the participants rated the whisky as tasting significantly sweeter in the Nose room than in the Finish room (P = 0.003). The ANOVA also revealed a significant difference between conditions with regard to the whisky’s woody aftertaste (F(1.257, 540.361) = 68.591, P < 0.001). When the participants responded in the Finish room, they rated the whisky as tasting significantly more woody (6.97 ± 4.8) than when they rated it in either the Nose (5.07 ± 2.11) or Taste room (4.77 ± 2.13) (P < 0.001 for both comparisons). Additionally, participants rated the whisky as significantly more woody in the Nose room than in the Taste room (P =0.002). An ANOVA was performed to assess any difference between participants’ liking ratings for the whisky in the different rooms and resulted in a significant effect (F(1.929, 835.411) = 34.133, P < 0.001) (Figure 6A). In particular, the participants liked the whisky significantly more when they rated it in the Finish room (7.06 ± 2.06) than in either the Nose (6.4 ± 1.9) or the Taste (6.37 ± 1.89) room (P < 0.001 for both comparisons). Summary of participants’ mean ‘liking’ ratings in Experiment 2. After sampling the whisky in each of the three rooms, participants used a 10-point scale (0 (not at all) to 10 (very)) to rate their liking for (A) the whisky and (B) each of the rooms. The error bars show the standard errors of the means. We also assessed whether there were any differences in how much the participants liked the three rooms (Figure 6B). An ANOVA revealed a significant result (F(1.928, 830.951) = 120.227, P < 0.001). In particular, the participants liked the Finish room (7.89 ± 1.72) significantly more than either the Nose (7.28 ± 1.91) or the Taste (5.96 ± 2.35) room, and they also liked the Nose room significantly more than the Taste room (P < 0.001, for all comparisons). Finally, we investigated whether there was any correlation between the participants’ liking for the rooms in which they tasted the whisky and how much they liked the drink itself. A significant positive correlation was documented between participants’ liking ratings for the room and their liking ratings for the whisky. This was true of all three rooms: Nose room r(436) = 0.541, Taste room r(437) = 0.406, and Finish room r(432) = 0.427 (P < 0.001 for all). These results should, however, be interpreted with some degree of caution, given the difficulty of disentangling whether such correlations reflect the fact that the atmosphere affected people’s liking of the whisky or whether instead they can be accounted for in terms of certain people generally tending to give higher ratings (independently of the question they are asked to respond to) than other people. If the latter were to have been correct, then it is likely that there would be a correlation between any pair of attributes that participants rated, and not just those related to liking. However, subsequent data analysis confirmed that this was not the case, hence adding at least some support to the claim that there was indeed a transfer of affective tone from the atmosphere of the environment to the participants’ liking of the drink. The results of the two experiments reported in the present study support a number of general conclusions: First, they reveal that the context, or multisensory environment, in which people taste/drink a spirit such as whisky can exert a significant influence on the drink’s nose, taste/flavor, and aftertaste. Participants’ ratings of the smell, taste, and/or flavor of the whisky changed by about 10% to 20% as a function of the room (that is, the multisensory atmosphere) in which they happened to be tasting the whisky. These results are all the more remarkable given that the participants in experiment 2 knew that what they were drinking was actually always the same drink (tasted from the same glass) in each of the three rooms that they visited. Thus, one would have expected there might, if anything, have been an assumption of continuity (or unity) in people’s minds that would have worked against any change in subjective ratings that were, in fact, obtained . Second, the results outlined here also support the conclusion that people’s feelings about the environment in which they happen to be tasting/drinking whisky can carry over to influence their feelings about the drink itself. Now, given the ecologically valid nature of our main study (experiment 2), and the very large number of participants tested (>440), it is important to note that there were a number of design compromises that were necessary given the confines of the experimental space in which the study was conducted. The first limitation is that it was not possible to counterbalance the order in which the participants experienced the three rooms: that is, the majority of people experienced the rooms in the order, Nose, Taste, and Finish. Hence, we cannot unequivocally exclude the possibility that certain of the changes in the participants’ ratings documented in experiment 2 could be attributed to order, or adaptation, effects resulting from the participants repeatedly tasting the same whisky over a period of approximately 15 minutes [33–35]. It could also be argued that repeated exposure to the drink over the course of people’s tour through the rooms may have resulted in their growing to like the drink more over the 15 to 20 minutes that people were in the building (a kind of mere exposure effect; ). However, given that our primary interest was in the influence of the various elements on the participants’ taste/flavor experience, rather than on their overall liking of the drink, this does not seem to represent a major concern for our conceptual framework. It is also important to note that inevitably, some degree of priming concerning the themes of the three rooms was transmitted to the participants by the guides who were escorting them through the spaces while explaining the overall purpose of the event in which they were taking part. Nevertheless, we would argue that the key point to note here is that the pre-tests were conducted under controlled laboratory conditions, with the order of presentation to multisensory experiences roughly counterbalanced, and there, significant effects were obtained in the absence of any experimenter priming effects. Hence, we would argue, ruling out experimenter priming as the sole driver of the results reported in the main experiment (experiment 2). In other words, some unknown combination of the instructions given to the participants and the multisensory atmosphere resulted in people rating the various aspects of a complex drink (in this case, whisky) differently under different environmental conditions. It is also possible that the experiment itself could have biased the participants’ responses; from the advertisements, in which people were invited to participate in a study designed to assess the influence of the environment on the perception of the whisky, to the experimental design itself, in which the participants were required to move from one room to the next, tasting the whisky and making the ratings, the participants were to some degree primed with regard to the aim of the evening. This bias is, however, pretty much absent from experiment 1, which may provide stronger (if somewhat less ecologically valid) evidence for the idea that atmospheric (or contextual) cues can actually affect the perception of the whisky. Nevertheless, it would still be beneficial for further experiments to assess the influence of the whisky in such ecologically valid contexts, by providing only the information needed, changing the drinks that people were given in each room, and having standard written instructions given to all of the participants. What the results of the main experiment reported here (experiment 2) suggest, then, is that even under realistic and noisy conditions, a change of the multisensory environment in which people drink can give rise to a very real change in their experience (or, at the very least, their rating) of an alcoholic drink (in this case, whisky). What is more, the effect of the atmosphere was not insignificant, typically resulting in a change of 10% to 20% in people’s ratings. At present, it is not possible to say what proportion of this atmospheric effect should be attributed specifically to the visual attributes of the environment, to the soundscapes or environmental fragrances that were used, or to some multisensory enhancement effect attributable to the combination of all three modalities of stimulation . Nevertheless, the key point to note is that by ensuring that the various sensory aspects of the environment were congruent we were able to deliver a significant change to people’s experience of the drink. The present results help to highlight the potential opportunity that may be associated with the design of congruent multisensory environments, paired with complex food or drink products . The results reported here also confirm that it really is possible to enhance the multisensory experience of the drinker by changing the atmosphere in which they drink (thus supporting the results of numerous studies that have manipulated just one element of the sensory environment [1, 3, 4, 37, 38]. Such results are also in line with previous claims that have appeared over the years in the literature [9, 18]. Finally, we should consider the use of whisky as a food or beverage product for use in experimental research. It is certainly true that there is far less empirical research on spirits compared with wine, say . However, what little research there is  suggests that people may not be as good at discriminating between, for example, single malt and blended whisky as perhaps many of them believe themselves to be. In the coming years, there is much interesting research to be conducted on the role of the shape of the glass in people’s perception of whisky, and in investigating a range of other product-extrinsic cues and their influence on the multisensory drinking experience [41, 42]. We thank Diageo and Story PR for providing the materials, supporting the recruitment process, data acquisition, and logistics. This project was not funded by a funding agency. CS, RJ, and SK developed the idea of the research project and coordinated the logistics, together with Diageo (The Singleton whisky company), and Story PR (a public relations company) for experiment 2. RJ and SK designed the audiovisuals for experiment 1, and the multisensory rooms for experiment 2. Diageo provided the whisky for use in experiments 1 and 2. CV, RJ, and SK, collected the data for experiment 1, and Story PR collected the data for experiment 2. CV and CS conducted the analysis and interpretation of the data, and drafted the manuscript. All authors read and approved the final manuscript.